Magnetic Gauge Holder for Dial Indicators - Gilson Co.
HM-338 Magnetic Gauge Holder for Dial Indicators consists of a holder base with mounting rod and swivel adapter with yoke, and is used to secure mechanical and digital dial indicators to ferrous metal surfaces. The stainless steel rod is 6x0.25in (152x6.3mm) LxDia and is set in a ball socket fixture, allowing for universal positioning. The holder base has a strong magnetic pull of more than 55lbs, and is 1.125x3.5x1in (29x89x25mm) WxDxH. 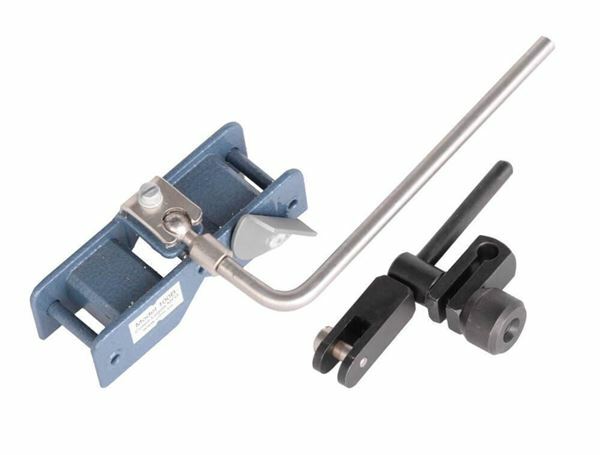 The 3in (76mm) long lug-back swivel adapter has a gun-metal finish, and attaches to the .25in rod with the included shoulder screw.